MONTREAL, Quebec, Canada, February 8, 2015 — Former UFC Welterweight Champion Georges St-Pierre has made sure that there is no confusion out in the world about his opinions on PEDs. GSP does not like PEDs and his claim is that his absence from the UFC ring is in part due to the overabundance of them and the lack of testing and punishment to athletes who might be using them. Dana White seems confident that GSP will step into the UFC Octagon(C) once again, but GSP is still talking about PEDs and still seems upset. GSP spoke out after Anderson Silva tested positive for not one but two different kinds of PEDs, claiming that he feels very sad for Anderson Silva, but that he didn’t want to talk about Silva, but the system as a whole. He went on to say that the fight between Diaz and Silva should have been canceled because PEDs are a biological weapon. 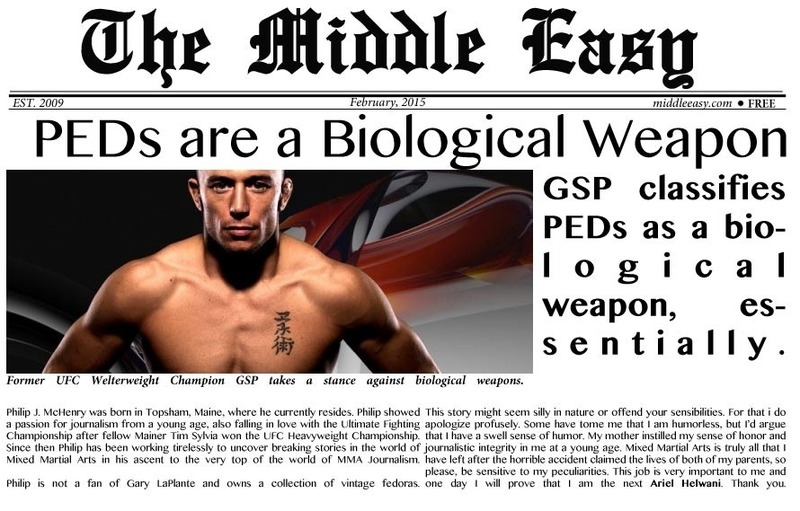 He continued by explaining that it was kind of like bringing a knife to a cage fight, which is actually not a biological weapon but a physical weapon, but this is GSP, so we’ll let it slide. It seems that, for the time being, the possibilities of a superfight between Anderson Silva and GSP seems out because GSP just wants Anderson to at least comply with the Geneva Convention, which he apparently cannot do. This is a sad day to be a sports fan.